Caught in the Act of Taking Action! In early 2018, NHPPA’s focus was on education. Key stakeholders of the natural health industry know the new threats facing Canada’s natural health products and practices. Now that everyone is current, we’re asking for help from retailers and practitioners. We’ve recently updated one of our Action Kits: “Store & Clinic Support Tools”. It provides a visual tool and access to printed material to motivate customers and clients. Hang posters in conspicuous spaces throughout your store, clinic or office. Educate your staff. Set up a petition station. Drive a new generation of advocates to get involved! 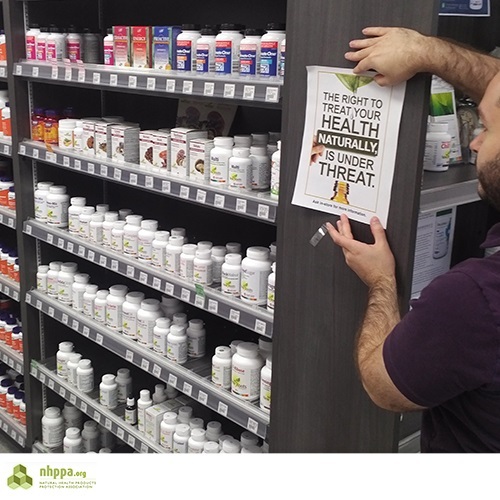 The call-to-action on each of our two posters directs the reader to “Ask in-store/clinic for more information”, giving you, the retailer or practitioner, the opportunity to assert yourselves as the natural health industry experts you are. You’ll find the original English and French petition is now officially available in Chinese! Download your posters and petitions now.